Reverse scrolling is one of those features that came along in Mac OS X 10.7 Lion that surprised a lot of people, on a computer it doesn’t feel quite as normal as it does on a touchscreen iPad or iPhone, but once you get used to it, it’s good. If you dual boot between 10.7 and 10.6 and you’re used to the Lion inverse scrolling, or you just prefer the way the iPad and iPhone scroll through documents and webpages, this app is what you’re looking for. You can get Scroll Reverser free from the developer. This app made the rounds a little while ago and I didn’t see a lot of use for it, but the more I use Lion the more I come back to Snow Leopard and find the scrolling differences strange to get used to. With this app, no more problems. If you’re confused here let me explain: Mac OS X 10.7 Lion defaults to the way iOS scrolls through documents, this is the opposite behavior to Mac OS X 10.6 and before. If you hate the idea, don’t worry. 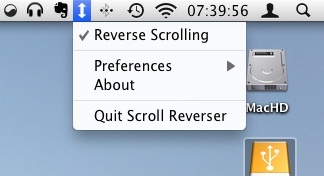 Scrolling isn’t permanently inverted and the behavior can be changed through the Trackpad/Mouse System Preferences. feels a bit weird at first but if Apple is defaulting to this it should tell you something about the future..
You can just go into System Preferences and select Trackpad and you can change the setting. Love the little app and for those without a track pad we are unable to even access it in system prefs to change it. So this is a god send. Actually everyone is talking about how Lion moves pages the same way that iOS does, which is not totally correct, and it’s the reason everyone is having a hard time with Lion. On my iPad, the screen moves in the direction I move my finger, which is what Lion does BUT ONLY IN THE VERTICAL MOTION. Lion is backwards of the iOS on horizontal movement. On my iPad, when I move my finger to the right, the page moves to the right and new text appears on the left. In Lion, when we do a three-finger horizontal scroll to the right, the screen moves to the left. THAT’S TOTALLY ASININE. And, while you can change the direction of the vertical scroll in preferences, you can’t change the BASSACKWARDS horizontal scroll. PLEASE, SOMEONE MAKE AN APP THAT WILL ALLOW US TO GET BACK TO REASON! @spydie – err no it doesn’t what u been smoking? good find. but really, nobody needs another app to install, apple just needs to respect and acknowledge the fact that by changing things, they also have to provide an option to reverse the change. GIVE US AN OPTION TO REVERSE BOTH UP-DOWN AND LEFT-RIGHT SCROLLING PLEASE!! !